Louise Parkinson: It’s easy to block out the things that upset us. It’s what most people do. By now we’ve all seen the movie already. It’s a small town with people with small lives. They’re not like you and I. They have quirks that set them apart. And while we meet them and are introduced to all their idiosyncrasies, something happens in this small town that no one is prepared to deal with. Before you know it, you’re taken back in time to see everything that led up to this moment. 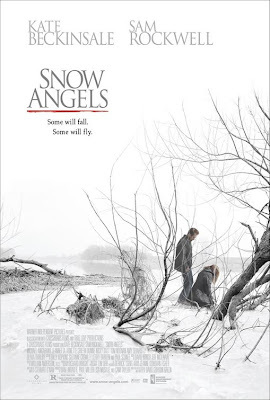 Yes, we’ve all already seen this movie but though it presents itself as exactly this movie, SNOW ANGELS is not this movie whatsoever. Sure it follows that simple approach but thanks to delicate, subtle performances and a soft, sensitive direction from David Gordon Green, SNOW ANGELS is at times as precious as the image the title conjures. Green has had an impressive year. 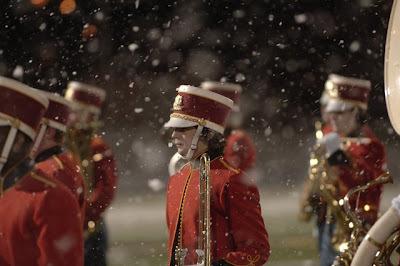 SNOW ANGELS first debuted at the 2007 Sundance film festival but only found its way to theatres this past winter to an art house audience that embraced it for many weeks. He followed that success with the widely popular stoner comedy, PINEAPPLE EXPRESS. Though they are nothing at all alike on the surface, they do share at least one similarity if you look a little deeper. Green breathes a certain peace into his films. Whether his characters are fumbling through their crappy lives or getting lost in their own zaniness, they are given the space to allow what needs to happen to happen. In SNOW ANGELS, Green, who also wrote the screenplay, gives us a mixed bag of characters who have all been involved with each other in some form or another and are all trying to follow the straight and narrow. The trouble is that while some are trying to do their best, others give into a destruction that affects all around them. SNOW ANGELS makes for a very pensive and somewhat melancholy evening in. Green is still light and playful though so while it does get bleak, it never loses hope. Still, the unique interaction SNOW ANGELS has with our hearts and minds is a profound one to be had.